You might have already seen the previous article I wrote on how to draw a sine of sound wave using Photoshop. This trick resulted in a pretty nice sine wave, but it wasn’t quite what I was looking for when I was preparing for an article. I needed a fancier drawing of a sound wave. 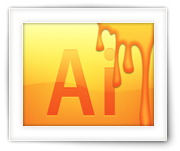 In this article I’ll show you a neat little trick where we will use Adobe Illustrator to make a fancy sound wave.